By the time Swami Vivekanad (known in his pre-monsatic life as Narendranath Datta) graduated from Calcutta University, he had acquired a vast knowledge of different subjects, especially Western philosophy and history. Born with a yogic temperament, he used to practise meditation even from his boyhood, and was associated with Brahmo Movement for some time. The unknown monk of India suddenly leapt into fame at the Parliament of Religions held in Chicago in 1893, at which he represented Hinduism. His vast knowledge of Eastern and Western culture as well as his deep spiritual insight, fervid eloquence, brilliant conversation, broad human sympathy, colourful personality, and handsome figure made an irresistible appeal to the many types of Americans who came in contact with him. To test whether her son was ready to go abroad, Swami Vivekananda’s mother invited him for dinner and fed him a scrumptious meal that she had prepared with love and affection. After the dinner, she offered him a dish of fruits and a knife. Once Vivekananda had cut the fruit and eaten it, his mother asked for the knife back. Vivekanand immediately responded by giving the knife. Mother replied, “Son, when I asked for the knife, I saw how you handed it to me, you gave the knife by holding its sharp edge and kept the wooden handle of knife towards me. This way, I would not get hurt when I take it and this means you took care of me. And this was your test in which you passed. By thinking about others before himself, Vivekananda had separated himself from ordinary folk as someone who whole-heartedly cares for other people. 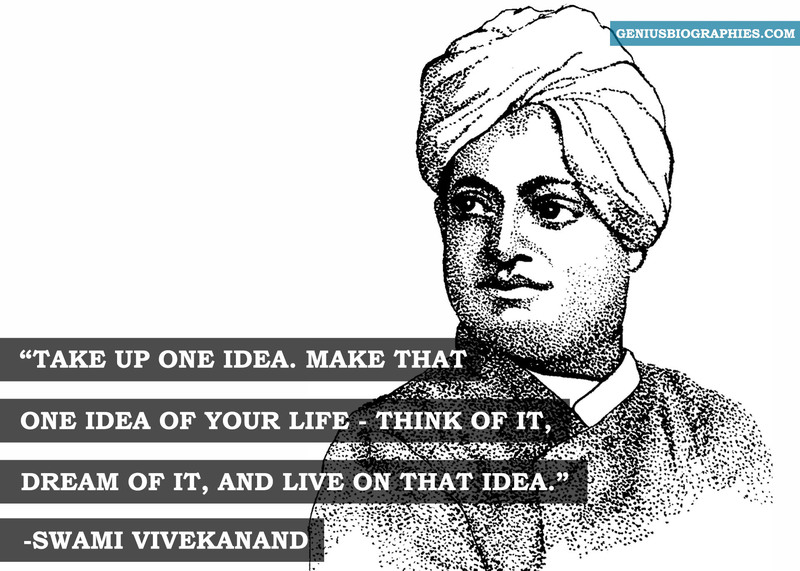 Vivekananda undertook epic travels of India and was exposed to the poverty problem that plagued the country. He identified the root of the problem as the neglect of the downtrodden. This neglect had been going on for so long that they had stopped believing in their own abilities and potential to improve their community. By identifying this problem, he was able to come up with a two-pronged strategy to infuse them with self-confidence and also improve their conditions. Thus the Ramkrishna Mission was founded with the aim of spreading secular knowledge to improve their economic condition; and spiritual knowledge to infuse in them faith in themselves and strengthen their moral sense. Never let your own ego get in the way. Open yourself up to learning.